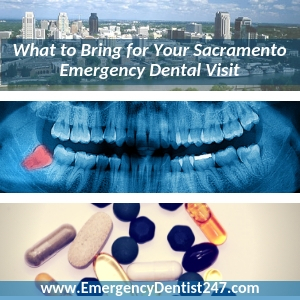 If you’re desperate to see an emergency dentist in Sacramento but it’s late at night, the weekend, or, even worse, during the holidays, this can be a serious problem. 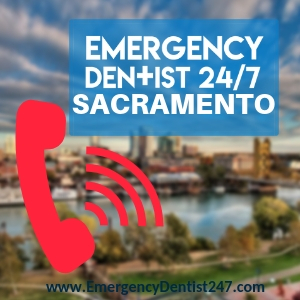 Fortunately for you, you’ve landed in the right place to find help from an emergency dentist Sacramento. We run a 24-hour emergency dentist referral network 7 days a week to ensure patients get the help they need immediately. Call us right now at (855)-352-6790, let us know what’s going on, and we’ll get back to you with an appointment booked in your name in a minimum of 24 hours. Don’t wait for the pain to get worse – call us! You will also need to ensure that you arrive with at least 15 minutes to spare. You will need this time to ask questions, fill out paperwork, and let the emergency dentist and/or their team know about any anxiety you may have. The only way they can go out of their way to ensure you’re comfortable is if they know how you’re feeling. Dental emergencies are typically the result of some form of accident or injury, but some are the result of an untreated, ignored, or unidentified oral health problem that escalated into something more serious. If your dental emergency is the result of the former, the first thing you need to do is make sure you haven’t sustained any head injuries. A concussion is a prime example of a sustained head injury. If you do have trauma to the head, you need to go to your local emergency room to seek treatment straight away. Losing a tooth can be scary enough, but not as scary as what can happen if sustained head trauma isn’t treated as soon as possible. If you’re completely sure head trauma hasn’t occurred, or it’s been treated, try your best to find the tooth. Make sure you handle the tooth by the crown and barely, if at all, by the root. 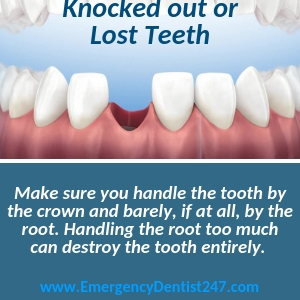 Handling the root too much can destroy the tooth entirely. If you’re successful in doing so, you can try putting it back in the empty socket as a temporary preservation method. If you’re unable to do so for whatever reason, the next best thing is to store it in a cup of milk or water and bring that with you to your emergency dentist appointment. The problem with oral infections is that patients typically don’t treat them like any other type of infection. Unfortunately, they are just as deadly and can be fatal if they are left untreated for even a short period of time. Check your mouth on a regular basis for small, red bumps, or anything that looks out of the ordinary, in general. Oral infections are not usually identified until the shooting pain starts, but checking your mouth for anything abnormal is the best way to catch one early on. Call us as soon as you possibly can if you believe an oral infection is present – even if it’s a minor suspicion. Fillings and crowns are very common, but that doesn’t mean you can brush off one falling out of place. They are put in place to protect a tooth from further damage, so leaving the tooth open and exposed is the best way to destroy it and make it impossible for the emergency dentist to refill or recap it. 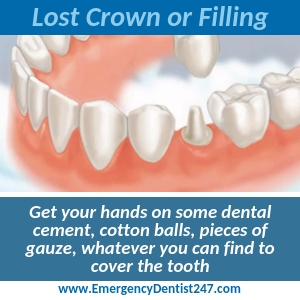 What you need to do if you lose a filling or a crown is get your hands on some dental cement, cotton balls, pieces of gauze, whatever you can find to cover the tooth. Whatever you use, make sure you’re consistent with it and keep the tooth protected at all times. Being told you need to have an emergency tooth extraction can be pretty scary, especially if you didn’t know you needed one until the last minute. Fortunately, the best way to be prepared is to know a bit about how one works so you know what to expect. A numbing agent will be used to ensure no pain is felt whatsoever – just some minor pressure when the tooth is being removed. Once it’s had a chance to kick in, the emergency dentist will then use a set of dental pliers to remove the tooth whole or in pieces, whichever is easiest. Once the tooth has been removed, you will then be given instructions on how to care for the extraction site at home. You need to follow these aftercare instructions to the letter to ensure the site does not become infected, or you’ll end up right back in the emergency dentist’s chair. Damaged or broken dentures are just as problematic as broken teeth, which make same day denture repair in Sacramento a very real necessity. Unfortunately this, plus emergency denture repair Sacramento, have been hard to find in the past. Because of this, we’ve made sure to have emergency dentists who work with denture lab technicians in our emergency dentist referral network. Repairs, fittings, and everything denture-related can all be taken care of in a single appointment, on the same day we book the appointment for you. Sometimes both an emergency dentist and an emergency room doctor are needed, but it’s important to know which one is needed first. Emergency dentists can save your teeth, but they cannot treat your head trauma. Emergency room doctors are the only option for treating your head trauma. Some hospitals have emergency dentists on call, but don’t count on this.